Getting a MAKEover: Part II…What do we do? This is the second of three posts about the development of our middle school makerspace in our library. Thanks @jrosenberg6432 for asking some great questions, which were used as the basis for the three posts. Check out post one to see where we started! I first need to state that the level that this has reached this year wouldn’t be possible without collaboration. Take a look at our collaboration story below to see how we connected with members of our personal learning networks (PLNs) to bring maker magic to our students. There are definitely more elements missing from this story. For example, attendance at events like Maker Faire allowed us to connect with other makers or including some of our other favorite hashtags for gaining ideas and knowledge like #STEM. 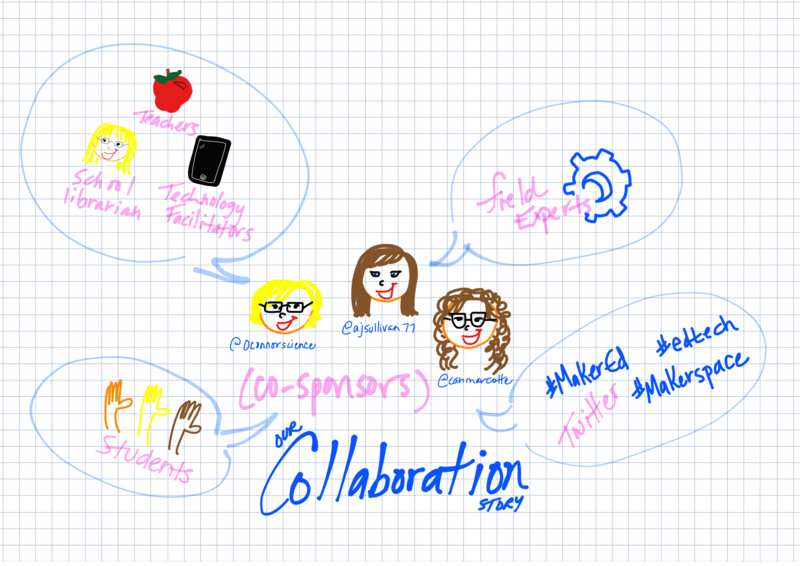 With all of this collaboration occurring, other teachers began to stop by. The music teacher has come up to help students learn about how speakers work and in turn, students have repaired speakers and an old record player that teachers found in their classrooms. The music teacher is going to come back and help students build dulcimers! Another teacher dropped in to teach students proper stitches when we started sewn circuits. The makerspace has allowed for teachers from all content areas/grade levels to come together and share their own maker skills! Reverse Engineering (introduced to get students to think about how things work and looking past the surface): Became so popular that teachers now drop off all of their “junk” in my office! Students have also brought their family’s “junk” in with permission. They have been enamored with this for the duration of the year. We have been creating labeled display boards to place on exhibit. A parent also came in to share in this experience, which was really fun! Maker Show (student-named): Students bring in projects or items from home that they are either working on or are curious about. We now start every Wednesday makerspace with a student sharing. We JUST launched a shared, public blog with the other middle school’s makerspace and appointed social media managers from each group to share our stories. We created a twitter handle, @WildcatMakers, a few weeks ago as well to allow us to connect with field experts and “real-life” makers as the students like to say. We just started our first design challenge to build their innovation muscles. 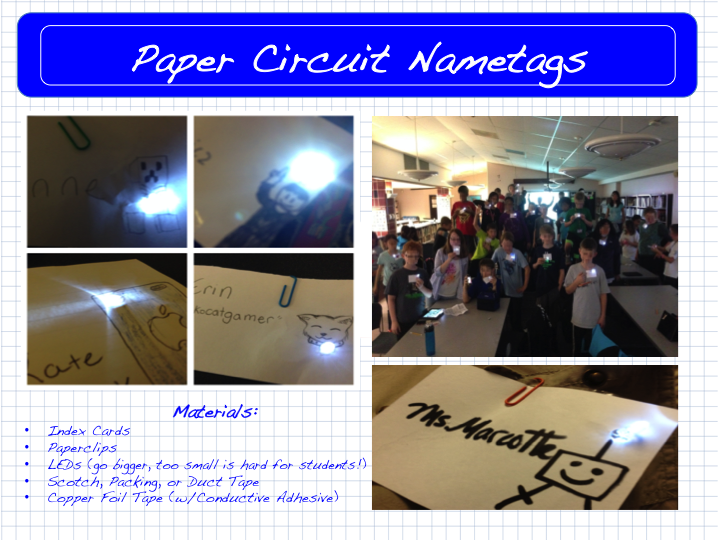 Other than this, we haven’t done any formalized group activities besides the first meeting where we created LED nametags (shout-out to MAET at MACUL 2014 for the idea!). This allowed us to talk about circuitry which is really important for them moving forward and provided an opportunity for a discussion around good hacks vs. bad hacks. Division of specialized teams: We have something called “Maker Modes” right now which students have identified as their greatest interest areas. We want to have these groups work together on things like the Arduino, Raspberry Pi, film production, crafting, wearable electronics, robotics, etc. and stick with them to really become experts in the technologies or skill sets. We are looking to hold some video chats with different makers (hobby or professional makers). We just held our first chat last week and are working on getting connections to more makers! There’s really no limit to where the remainder of the year will take us because we really let student-interest guide us. And, we are willing to beg for materials/resources from anyone! Getting a MAKEover: Part II…What do we do? by Candace Marcotte is licensed under a Creative Commons Attribution-NonCommercial-ShareAlike 4.0 International License. 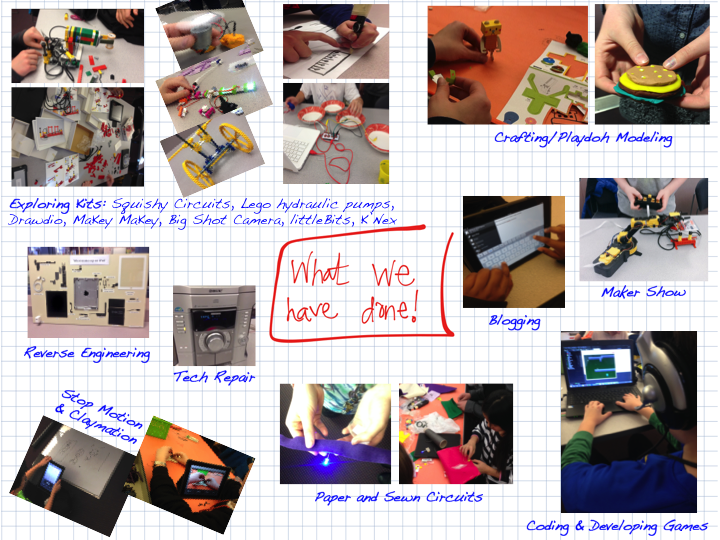 Categories: MakerEd | Tags: edtech, ideas, maker, makerspace, STEM | Permalink.